VIJAY FANS, DID YOU CHECK THE SPECIAL EDITION OF VIJAY IN FACEBOOK? The fans of top stars in our industry are always known for their unique tributes to their favorite actors on their birthdays. We often find theaters playing some old hit films of the stars, fans creating common profile pictures and making all the fans change theirs, milk abhishekam on the large cut-outs, cake cutting and much more. The latest unique idea is a Facebook profile picture frame. 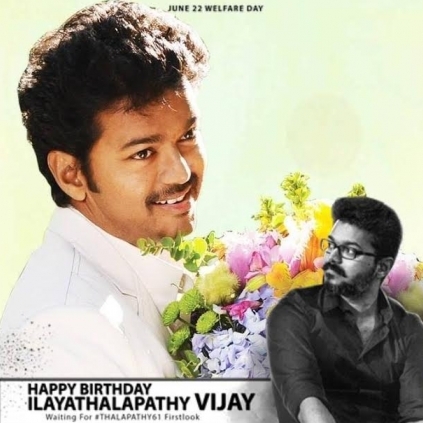 Fans of Ilayathalapathy Vijay have created 2 unique frames to celebrate their idol's birthday, which is coming up on the 22nd of June. We haven't seen such an idea for any other particular star from Kollywood earlier. There was one such frame created for the Chennai 28's sequel, and it is usually done for famous football teams and other sports franchises. This sure is interesting. Viral: Prabhas's new interesting makeover! Shocking: Director reveals a secret about ‘The Mask’ after 23 years! "Samantha is close to my mom"
Ilayathalapathy Vijay's Four Movies To Re-release On His Birthday?